A few weeks ago, a new customer, Gerd Pachauer, came into the ligfietsgarage to pick up his new Sinner Mango. Number 211. Many people come to collect their new bikes, and many ride them straight home. However, this customer was from the South of Austria and his first ride on the bike would be an epic 1900 km in ten days ride to get home. That's an average of 190 km a day, or nearly 120 miles, into a prevailing wind and in winter. Not bad at all with a brand new bike, and showing a lot of confidence in his new machine. Gerd didn't even take the most direct route, but first headed west to cross the Afsluitdijk and he further rode through a good part of the Netherlands and Germany, following the course of several rivers including the Rhine, before reaching Austria. Gerd took many photos on the way, and has put them in an online gallery. The photo above is one of his, showing his Mango as he rode through a mountain pass. For those who understand German he also has a ride story in the German velomobile forum. What's more he has continued to make videos on his youtube channel. Makes me feel guilty for not riding my Quest very much. Only ~2500 miles my first year. Planning to double that for the second year. I am extremely impressed by this feat, and I would have loved to also pick up my own Mango in person and ride it home... seeing this post, I just have to comment and say hi! I am all the more impressed by Gerd's journey, and the beautiful photographs he took! This is indeed awesome. 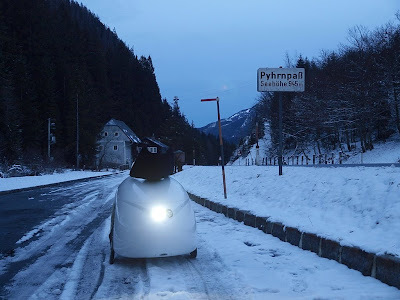 I am very impressed with this feat and would love to pick up my own velomobile in this way. Good show. Now that is an impressive journey!! I lead a ride across the Afsluitdijk last year. There's a video of this. It's a very unusual place to cycle. We did it in early summer with a tailwind and no rain. Gerd did it in the opposite direction in the cold as part of his epic ride. His Mango will have made a big difference to the comfort of the ride in those conditions.